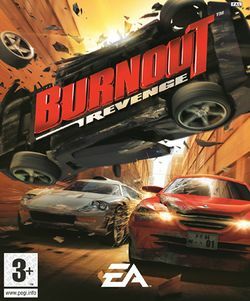 Burnout Revenge is the fourth racing game in the Burnout series. It was developed by Criterion Games and published by Electronic Arts. It was released for the PlayStation 2 and Xbox on September 13, 2005 and Xbox 360 on March 7, 2006, alongside the PlayStation Portable and Nintendo DS title Burnout Legends. Similar to its predecessor Burnout 3: Takedown, Burnout Revenge features in-your-face, high-speed racing, complete with spectacular crashes, explosions and takedowns! The game focuses on a mixture of racing in the midst of rush-hour traffic and vehicular combat; players use the cars themselves as weapons. Revenge also expands on the combat side of its gameplay with new features such as "traffic checking" (ramming same-way traffic), "Vertical Takedowns" (landing on a rival car after the player's car drives over a jump), a new game type (Traffic Attack), significant changes to the gameplay of Crash mode (a game type where players attempt to cause as large a crash as possible), and a rating system in-game where your incentive is to increase your Rating, complete with 10 ranks. A sequel to Burnout Revenge, titled Burnout Paradise, was released for the PlayStation 3 and Xbox 360 on January 22, 2008. Spin-offs: Legends · Dominator · Crash! This page was last edited on 9 July 2016, at 19:14.